Our 11 oz. 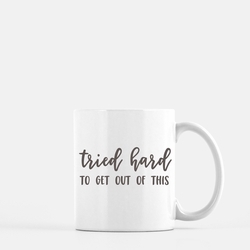 white ceramic "Tried Hard" mug features a simple design and hilarious sentiment; perfect for you or as a gift. Your life needs one of these yesterday.